To anyone who does pro life work these are sweet words. In virtually every case since Roe v. Wade where the abortionists have filed a challenge in court to legislation that in some way affects the unlimited right to abortion on demand, they have been able to enjoin the enforcement of that legislation until the entire appellate process was completed, usually years after the effective date of the law, and do so without presenting any more than the most minimal of evidence. But that was not the case here. These are important requirements intended to produce genuine informed consent, but they are clearly not onerous, especially in view of the potential results, namely the death of a human being (even if that human being may arbitrarily not yet be recognized as a legal person). But even the smallest regulation of abortion on demand is fiercely resisted by the pro abortion crowd as a heavy and unjustifiable burden to a “woman’s right to choose.” In most cases since Roe the federal courts have acceded to such pro abortion arguments, no matter how weak. Translation: The appellee abortionists were not entitled to a preliminary injunction because the appellate court did not find anything about the law unconstitutional, and because it does not think that the appellees will prevail in the trial of the case in the federal district court. Further, the appellate court expects the trial court to proceed to trial with an understanding of the law as articulated in its decision. The basic claim of the abortionists in the case is that the requirements of the sonogram law are in violation of the First Amendment because they impose a constitutionally proscribed burden on the free speech and privacy of both the woman seeking the abortion and the abortionist. 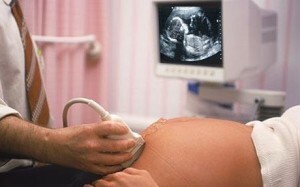 However, the allegedly intolerable burden requires only that before the abortionist kills his patient’s baby that he ensure that a sonogram is performed on his patient, that he explain the sonogram image to her, and that he make sure that she has an opportunity to see the sonogram image and hear the baby’s heart beat, if she chooses to look and to listen. The court, relying on the 1992 Supreme Court case of Planned Parenthood of Southeastern Pennsylvania v. Casey, did not find the requirements of H.B. 15 constitutionally invalid. Turning to appellees’ specific objections, the provision of sonograms and the fetal heartbeat are routine measures in pregnancy medicine today. They are viewed as “medically necessary” for the mother and fetus. Only if one assumes the conclusion of appellees’ argument, that pregnancy is a condition to be terminated, can one assume that such information about the fetus is medically irrelevant. The point of informed consent laws is to allow the patient to evaluate her condition and render her best decision under difficult circumstances. Denying her up to date medical information is more of an abuse to her ability to decide than providing the information. Of course, that is precisely what is at the core of the abortionists’ complaints about the H.B. 15, and why the law is so important. For all of the talk about pro choice and freedom, the last thing that the abortionists want inside their killing chambers is the truth. Before the child is terminated, the truth must be terminated first. That a woman in distress and/or in ignorance would kill her child, and later come to regret it is of no concern to the abortion industry. Like drug dealers, the practitioners in the blood trade of abortion offer the false promises of instant relief and future pleasure and happiness if the woman pays their price in money and innocent blood. But those in pro life work know that a mother’s regret from having killed her own flesh and blood is more than a mere possibility, and that a warning of the probability of that terrible and painful regret should necessarily be a part of any woman’s consideration of abortion. The same point was made by the Supreme Court in the Casey case. Nor can it be doubted that most women considering an abortion would deem the impact on the fetus relevant, if not dispositive, to the decision. In attempting to ensure that a woman apprehends the full consequences of her decision, the State furthers the legitimate purpose of reducing the risk that a woman may elect an abortion, only to discover later, with devastating psychological consequences, that her decision was not fully informed. The burden from which the pregnant woman should be protected is not the image of a child on a sonogram and the sound of that child’s heart beat, but the truly horrible burden of carrying around for the rest her life the guilt from having killed her child in some sterile abortion chamber. One day, we hope and we pray, the State will be able to directly protect the unborn child from the abortionists knife, just as it protects every other human being against homicide. In the meantime, the State of Texas has every right to insist that the killing of the innocent unborn not take place until the mother is told who it is she is killing, and is given the opportunity to see the victim and to hear the beating heart of that victim. It is a profoundly charitable act for both the child and the child’s mother.